In the annals of Wall of Sound history the Girlfriends sang about ‘Jimmy Boy’, Timmy & the Persianettes about ‘Timmy Boy’ and Darlene Love about ‘Johnny’ on the alternate version of ‘Christmas (Baby, Please Come Home)’ So calling your band Johnny Boy would definately be appropriate if you plan on recording a convincing Spector pastiche. Here’s the best kept secret of the charts in 2004 – with the longest song title to boot – ‘You are the Generation that Bought More Shoes & You Get What You Deserve’ by British indie pop duo Johnny Boy. A single so obscure today that the below low-quality youtube upload of the official video was the only one I could find. Cover for the lone Johnny Boy album. Still, listen through the inferior sound quality for a fantastic track co-produced by James Dean Bradfield of Welsh rockers Manic Street Preachers. The boy/girl duo consisting of Lolly Hayes and Andrew Davitt infused the trademark ‘Be my Baby’ beat with some clever, political lyrics not often found in modern Spector soundalikes – and all the more charming for it. Sadly, this explosive mix of reverb, drone and glockenspiel infused with grit and punkish agression only reached # 50 on the UK singles chart when released in 2004. It’s time to dust off yet another Spector production, – one that’s not too obvious to focus on when discussing Spector’s body of work. Today I’d like to focus on a track which actually was a sizeable hit but that I think tends to get both overlooked and dismissed during talks about Spector’s oeuvre; ‘Silence is Easy’ by UK group Starsailor and Spector last ‘real’ production job if you, as I do, discount his work with Hargo ‘Crying for John Lennon’ and the supposed production of wife Rachelle’s cheesy ‘Out of my Chelle’ album. Produced by Spector? Yeah right! As if! The Hargo track sounds a little more like something the former Tycoon of Teen could have been involved with but it’s still a far cry from his Wall of Sound glory days. ‘A Phil Spector Production’ it says on the cover. Hmmm. Really? So, back to ‘Silence is Easy’ and a short recap. Spector had teamed up with this young UK indie band a while before that fateful night at the mansion where Lana Clarkson lost her life. Allegedly, Spector was hired by the band with an eye towards producing a whole album’s worth of material but along the way, the band didn’t feel Spector’s vision, or way of working for that matter, matched theirs and thus gracefully ended the working relationship. While pleasant and beautifully sung by Starsailor lead vocalist James Walsh, the latter’s Spector production credit should puzzle any fan of the Wall of Sound. If you didn’t know he seemingly had a hand in it, you wouldn’t be able to tell at all. ‘Silence is Easy’ however has a gradual build-up and a stately elegance that oozes Spectorness; think his work during the 70s on the Dion album or the singles by Cher. James Walsh’ vocal style will throw some listeners off but if you really get into it, like I did from the very first time I heard the song, his dramatic lead vocal really compliments the dark feel of the lyrics and Spector’s production. How much say did Spector have in the studio while recording the song? Well, who knows – and the final aural outcome is probably some sort of compromise between Spector, the band and their management. I doubt the production as is is totally as Spector would have it. Left to his own devices, I feel pretty sure that the track would have been further enhanced by echo, more acoustic, strummed guitars, a string section etc. Still, there are enough Spector trademarks throughout to make me consider it a genuine production by hum, none the least the cool tinkling glockenspiel that pops up mid-way through and adds a great deal to the production’s feel and build-up. What’s your take on the song? How do you feel about it? Lost classic or something that’s best forgotten when discussing overlooked Spector productions? 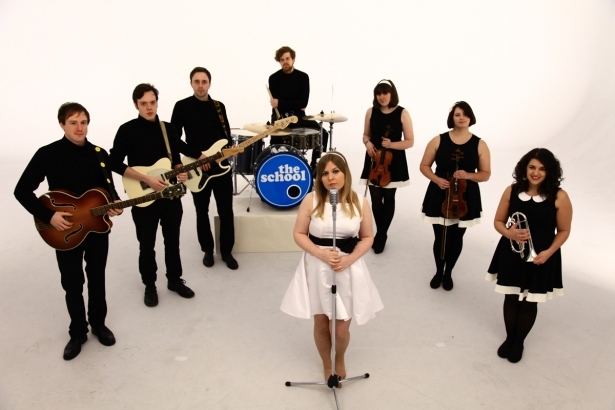 In the early months of this blog I published a post about Welsh pop band the School and their fab blend of 60s retro pop, twee and indie pop. Go here for two superb examples of their more Spectorious offerings highlighted in my ongoing series on modern Spector soundalikes. Last year the School issued their much awaited third longplayer and it’s been on my to-do list ever since to post a short review on here. I’m really bummed I didn’t get to do so earlier, but better late than never, I guess. As expected, ‘Wasting Away and Wondering’, the third offering from this great band, is every bit as enjoyable as their first two albums. And I recommend both highly! Lead vocalist and main songwriter Liz Hunt is the band’s focal point and she really has a knack for churning out catchy melodies that could easily have emanated from the legendary cubicles of the Brill Building. The material is that good and really shows her appreciation for and understanding of that bygone era’s wide-eyed romanticism. This is classic pop then, with a capital C. As such the album picks up right from where the second album left off. You can’t claim that the School reinvent themselves with this release but hey,… if it ain’t broke and all that. For some, Liz Hunt’s vocals will undoubtedly prove a bit bland and undistinguished – she’s no Darlene Love, that’s for sure. But even though she’s not a soulful belter by any means, her pure, whispering tone is strangely comforting once you get used to it. A song like ‘Don’t Worry Baby (I Don’t Love You Anymore)’ will have you check credits to see if you’re listening to a hitherto unknown Goffin-King song. Beautiful arrangement on this tearjerker that wouldn’t have been out of place on, say, a Shirelles album. Sadly, this time around the School hasn’t recorded the type of full-on Wall of Sound tribute that graced their other albums, so we’ll have to do with the gloomy, Shangri-Las like ‘He’s Gonna Break Your Heart One Day.’ In spirit, I’m sure ‘Shadow’ Morton taps his foot approvingly. The stand-out track for me though is ‘Put Your Hand in Mine’ with its pretty melody and a breathy Liz Hunt vocal that fits the mood of the song perfectly. Nice string arrangement too! I can’t say enough good things about this band and I’m just happy that there are still musicians out there putting out heartfelt tributes to the girl group sound, the wall of sound and 60s pop in general. I’ll advise all Cue Castanets readers to check out all three releases by the School – I’m sure you’ll find something to your liking. ****½ stars out of six. The School may be Wales’ best kept secret and I’ll tell you why with a double-video post. So far this great band has released two albums; ‘Loveless Unbeliever’ from 2010 and ‘Reading Too Much into Things like Everything’ from 2012, and believe me, both contain timeless pop of the highest caliber. Fronted by lead singer and main songwriter Liz Hunt these guys & girls churn out incredibly catchy tunes that prove listening to 60s classic pop records is the perfect musical schooling. Who knows? Maybe that’s what their name is meant to imply? When you hear their songs it’s no surprise that they list the Ronettes, the Shangri-Las, the Beach Boys and modern bands like Belle & Sebastian and Camera Obscura as their main influences. Listen to any track off the School’s two albums, and you’ll quickly hear that they’ve sprung from the same wide-eyed romanticism. 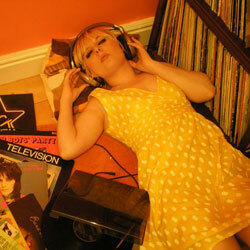 Liz Hunt at her pad – probably spinnin’ Phil Spector’s Rare Masters vol. II. I really can’t recommend this band enough and look forward to their third album which is set for release next year. Both their past albums have had one bonafide Spector soundalike, so it makes sense to include both songs here. It’s just so obvious from these two productions that the School sat down and said ‘Ok, let’s pull out all stops trying to make our own take on the Wall of Sound.’ And they’ve pulled it off marvelously! Just listen to ‘I Don’t Believe in Love’ when those fat, reverbed drums kick in after the male intro lead. Really cool! I’m wishin’ and hopin’ they’ll strike gold a third time on their upcoming album. They’ve certainly set up a beautiful tradition of ‘one Spector clone’ an album that I hope they’ll continue to honour.